: Histoires indépendantes, compilation type best of. 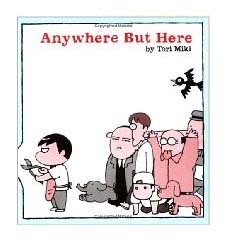 "Anywhere But Here" is a wordless comic strip. Miki's unnamed lead character (modelled after himself) works as a bookstore owner but somehow finds himself entangled with aliens, alternate realities, and other mysterious disturbances in the space-time continuum. Only the best of the two first volumes of "Anywhere But Here" has been selectionned.